When I first decided to give up manually scrubbing my teeth, the Oral-B Pro 1000 electric rechargeable toothbrush was the first electric toothbrush that I bought. I’m ashamed to say that I didn’t do any research, it was kind of an impulse purchase. I picked it up from the supermarket shelf because the price seemed reasonable. I thought the blue and white color scheme looked nice and modern, and I assumed that being a Braun, it would conform to my stereotype of German-made devices: (I know it’s wrong but I can’t help myself) I assumed it would be well engineered. Although the blue ones are common, I should mention that a black one came out in early 2016. With this one, I can only think that Braun wanted to appeal to the Goth market. It’s exactly the same inside, it just looks moodier. I am happy with blue. Inside the box, you get the Oral-B Pro 1000 Handle, ‘Cross Action’ toothbrush head, battery charger and instruction manual. If you find a coupon offering a discount on replacement toothbrush heads then put it somewhere safe because you will be replacing them once every three months, just as you would with a normal toothbrush. If you haven’t had an electric toothbrush before, you’ll enjoy the change. the Oral-B Pro 1000 has a circular head full of bristles that oscillate (and pulsate) quickly to remove plaque from your teeth. The main benefit that they have overstepped the normal toothbrush is its quickness of movement. Only a hummingbird could possibly brush that fast. The blue colored part of the handle is made of rubber and it feels sticky whether your hands are wet or dry, which means it won’t slip. My small daughter wants to be a grown-up and so she shares my Oral-B. She’s a bit clumsy at her age and her hands are always wet, but she hasn’t dropped it yet, so that’s a plus mark. The toothbrush lets you know what’s happening with the battery via two light-up indicators shaped like a battery and an electrical plug. The battery one blinks green when you’re charging and the plug one lights up pink when battery power is getting low. You won’t know exactly when it’s going to fail, but you’ll at least have an idea that the end is near and it needs a charge. There’s a hole in the base of the handle where it sits on the charger. Make sure that you keep this area clean as it’s easy to get it gunky over time. (Yes, that was a confession that I sometimes let things get gunky.) In fact, swill the whole thing off with water after every brush, as toothpaste slop can turn into cement if you let it dry. The Pro-1000 can take seven different toothbrush heads which you have to buy separately. Some are softer for sensitive teeth, so they’re gentler on gums; other heads are designed just for braces. I was perfectly happy with the Cross-Action head that it comes with. This one may not suit everyone though, as the bristles are quite stiff. It’s called Cross-Action because those bristles aren’t straight. They point at different angles as this is supposed to help remove plaque from along the gum line. You’ll notice that some of the bristles are blue. Over time these will begin to fade. This is a useful feature. Oral-B calls them “Indicator Bristles” and they tell you when to replace your toothbrush head. 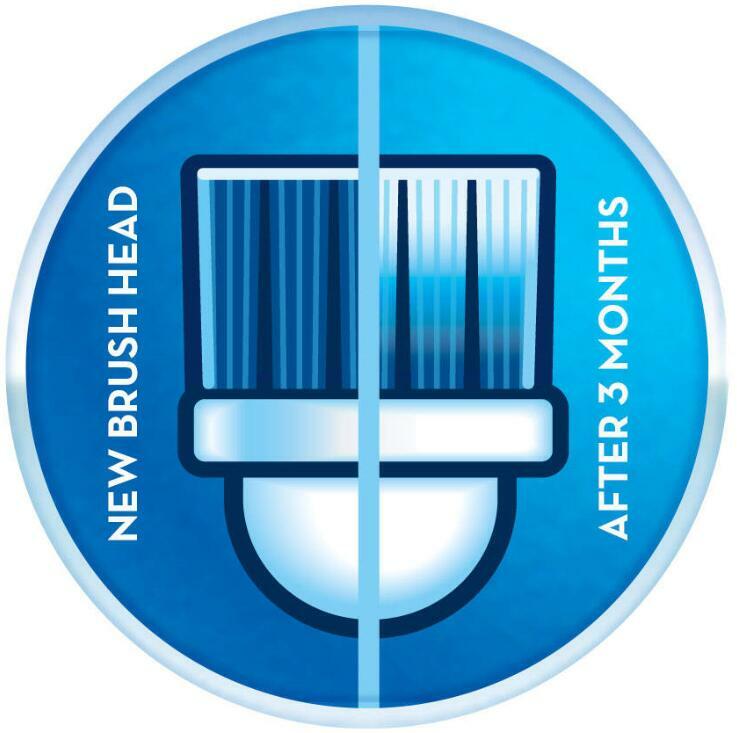 With brushing twice a day, I found that the bristles faded near to 3 months, which is about when they’re supposed to. Proper brushing takes at least two minutes, or so dentists keep telling us, and the Pro-1000 has a built-in timer so you don’t have to bother looking at a stopwatch. I like this feature. Every 30 seconds it pauses, so you spend 30 seconds brushing the top-left teeth, then 30 seconds on the top-right. Then 30 seconds on the bottom-left teeth and 30 seconds on the bottom-right. At the end, the Oral-B Pro 1000 will pulse three times so you know you’re finished. The actual brushing experience is pleasant. It supposedly pulses 20,000 times minute and oscillates 8,800 times a minute. I don’t know whether that’s considered a lot or not, but it feels fast and it certainly does the job. You get the Oral-B Pro 1000 Handle, ‘Cross Action’ toothbrush head, battery charger and instruction manual. If you find a coupon offering a discount on replacement toothbrush heads then put it somewhere safe because you will be replacing them once every three months, just as you would with a normal toothbrush. Cross-ActionBrush Head that kind of wraps around each tooth with bristles angled at 16 degrees. The blurb says it rotates and pulses to break up and remove up to 300% more plaque along the gumline than a regular manual toothbrush, and it certainly feels like it does that. Pro-Timer. to let you know when you’ve reached the dentist recommended 2 minutes of brushing time. It also tells you to brush a different quadrant of your mouth every 30 seconds. Pressure Sensor. I like this a lot. It stops the pulsing movement if you brush too hard, so you never have to worry about punishing your teeth. Daily Clean Recharging Mode, so it’s always ready to go. The brush heads just click into place and a quick tug gets them off again. When you buy the replacement packs you can select from different colored rings to identify your own brush head and avoid the sickly horror of using someone else’s. Good to know if there is more than one of you in the house. The only time this won’t work is when it is brand-new. When you take it out of the box, it will need a charge, so you have to drop it on the charger. This is a plastic lump with a smaller lump sticking up from it. It fits the hole in the bottom of the Oral-B Pro 1000. The charging cord is about a meter, long which should be enough for most people. After about 24 hours your toothbrush will be fully charged and the indicator will switch off. Oral-B claims up to 7 days of use on a full charge. When I first got the Pro-1000 it gave about 10 days’ use, which is pretty good. Over time, the Ni-MH batteries will not hold their charge for so long. This is just something that happens with them, but if you run the Oral-B completely dead once every six months then this will keep it charging efficiently for longer. Most of the time you should keep it on the charging unit anyway, which is perfectly safe to do. There is no danger of overcharging it. The extra brushes you can buy have different names like ‘floss action’ and ‘precision’ clean. I can’t comment on these other 6 heads as I haven’t used them, but it’s good to know these options are available for people who want harder or softer bristles. It’s 23 ½ cm tall, so it might not stand up inside smaller bathroom cabinets. The bristles on the included head might be a bit stiff for some people, so if that is you, you will need to invest in something softer. It’s a bit loud when it working. I give it 7.8/10. I know that there are more expensive toothbrushes with fancier features, but I just want to get my teeth clean; I don’t need it to cook a soufflé for me or walk the dog. I just want it to clean my teeth and it does a great job. It’s very simple to use, but you have to remember to routinely charge it and you have to put that six-month total discharge down on your calendar, otherwise you’ll forget. Also, you have to make sure that you do change the brush heads when the faded blue tells you to, otherwise the bristles become all splayed out. I’m more than happy with my Oral-B Pro-1000, and if it ever dies I’ll just get another one. Sorry, not Ni-cad battery. They have been illegal in the EU for years. The Oral-B Pro 1000 was released in the early 2015. We checked with Oral-B regarding the battery issue, the built-in rechargeable battery of currently on sale Pro 1000 series have been replaced by Ni-MH to meet the requirements of environmental protection. The Oral-B Pro 1500 has a lithium-ion battery. I bought one that was delivered yesterday, and it works great!